The Book Chook: Let’s Hear it for Reading Aloud! 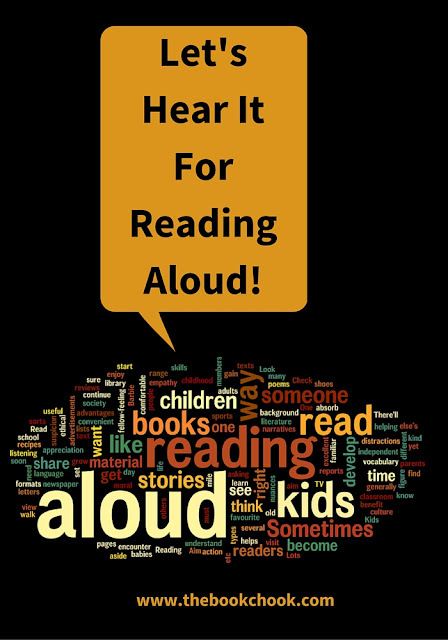 Let’s Hear it for Reading Aloud! Earlier this year, I published Let’s Hear It for Picture Books! Several people commented how much they enjoyed that article. I love the idea of celebrating things I’m passionate about, so I followed up with Let’s Hear it for the Arts! Today I'm sharing another of my passions - reading aloud. Lots of people enjoy reading aloud to their kids. But how does it benefit the children? * If we want our kids to grow up to be readers, we should share stories with them from when they're babies. Kids who are read aloud to absorb vocabulary and the nuances of language. They gain an appreciation of books and stories and continue with them as they learn the skills to become more independent readers. * By reading literature aloud to our children we are helping them develop the moral and ethical background they need to become useful members of our society. * By listening to stories from our own culture and others, our kids get to walk a mile in someone else’s shoes. They get to think about and understand someone other than themselves, to develop empathy and a fellow-feeling for them. * Reading aloud is an excellent way to share a range of different text types with our kids. They will encounter all sorts of texts at school and in life generally, and it helps if they are familiar with formats like narratives, letters, lists, recipes, advertisements, poems, reports, reviews etc. What if parents don’t like reading aloud, yet want their children to have those advantages too? * I would start by asking myself what it is about reading aloud I don’t like. Sometimes it’s because we’re not sure what to do. Sometimes it’s because we think there’s a “right” way to do it that we don’t know about. Sometimes we figure we must read Barbie books or some other kind of material we view with suspicion. * One way to find out more about reading aloud is to visit a library or a classroom where kids are read to. There’ll you see someone in action who has read many books aloud. Check out several adults reading aloud and you’ll soon see there’s no one “right” way to do it. Look for material you are comfortable with. Read some of the sports pages in the newspaper to your kids, or read aloud one of your old favourite books from childhood. Aim to set aside a convenient time each day for reading aloud, and aim for it to be a time with no TV or other distractions. * If you’d like to borrow some strategies I use when I read aloud to kids, check out Let’s Celebrate World Read Aloud Day 2015 at Scholastic. You might also like to read Tips for Reading Aloud and Ten Read-Aloud Lessons from Pre-Schoolers. On Wednesday, I listed some Bookish Christmas Gift Suggestions. If you’d like a hugely rewarding gift, one that will impact their lives forever, delight your children with the gift of reading aloud!